In 1901, it was estimated that 75 percent of Southern Appalachia was still forested and 10 percent was still in virgin growth. By 1920, heavy cutting had reduced this forest substantially, resulting in rapidly eroding cropland and pasture and heavily logged forests where little of value was left. A fledgling conservation community worked to create national forests to protect the headwaters of major rivers, the Blue Ridge Parkway stretching almost 500 miles along the crest of the Blue Ridge Mountains, the Great Smoky Mountains National Park, and the Appalachian Trail, among other significant areas. Most of the conservation issues raised in the early 1900s remain today. Although many large blocks of public land are now guided by sustainable management plans, the vast amount of forestland in the region is privately owned. The long-term goal of Western North Carolina’s conservation community is to protect and conserve places of important wildlife habitat, water quality, cultural and economic significance, and scenic value. This is accomplished on public lands as well as through the careful combination of private land acquisitions from willing sellers and conservation easements by individual property owners. Many people feel that the Southern Blue Ridge Mountains are at a pivotal point for species, habitat, natural beauty, and even mountain culture. The conservation community, the legislature, and the public are making strides in reducing the risk of irreparable losses. The addition of lands managed for conservation during the past decade, along with a stated goal to continue putting land into a protected status, is one of many strategies in place to sustain biodiversity in Western North Carolina. The Conservation Planning Tool (CPT) consists of a database of statewide assessments that implement maps to identify, evaluate, and prioritize important natural resources required to maintain healthy and sustainable ecosystems and to support key elements of human health and the economy. The CPT includes five assessments and maps relevant to the Mountain Resources Commission areas of interest: Biodiversity/Wildlife Habitat, Forestry Lands, Water Services, Farmland, and Open Space and Conservation Lands. 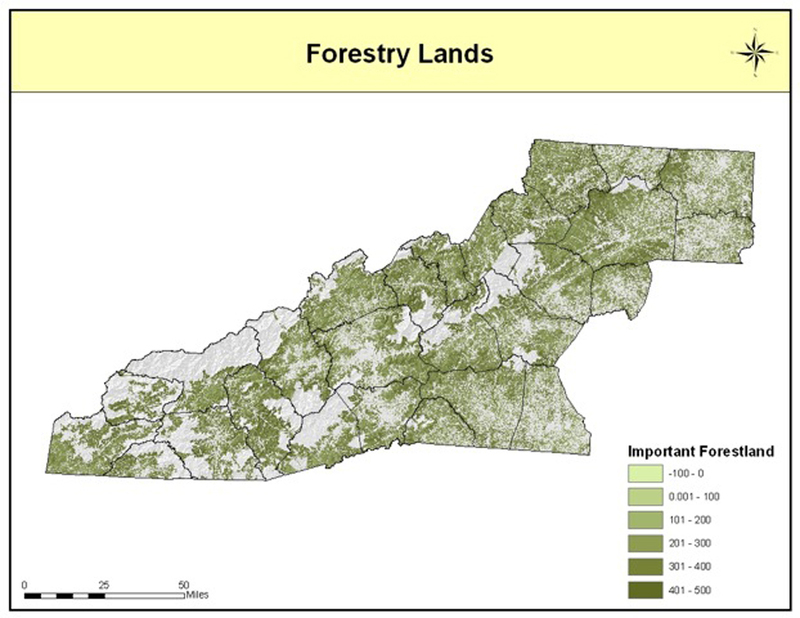 This planning tool illustrates the locations and conservation values of significant natural resources throughout North Carolina, and has been applied by local governments, state agencies, regional councils of governments, funding programs, and conservation organizations to support land use, conservation, mitigation and transportation planning, and decision-making. The Biodiversity/Wildlife Habitat Assessment prioritizes aquatic and terrestrial habitat, landscape function, and connectivity. This assessment focuses on (1) the biodiversity of aquatic and terrestrial species and communities, (2) large-scale landscapes, including core wildlife habitats and habitat connectors, and (3) lands important to ecosystem processes, such as riparian buffers and wetlands. The Forestry Lands Assessment prioritizes high-value forest resources that provide forest products and ecosystem services and threatened forest resources that are at risk from wildfire, pests, disease, or forest fragmentation. This assessment is represented by two map products: Important Forest Lands and Threatened Forest Resources. The Farmland Assessment prioritizes farm and forestry priority areas, including lands and agricultural support infrastructure. 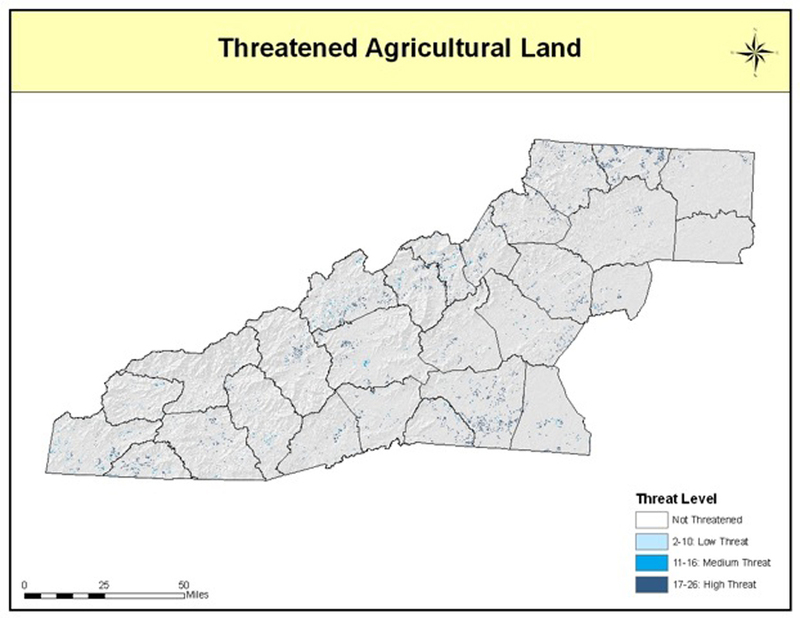 The assessment is grouped into two sections: (1) viable agricultural lands, which are lands important for continuing North Carolina’s strong agricultural economy and which currently have the necessary agricultural infrastructure to support those farms; and (2) threatened agricultural lands, which includes those farmland resources that are threatened by public works infrastructure and suburban growth. 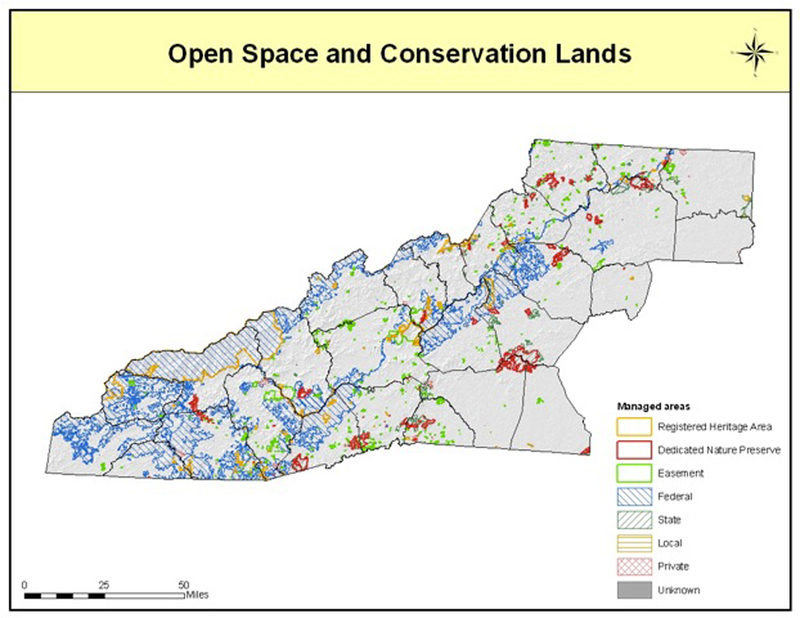 Existing open space and conservation lands are addressed collectively in the Open Space and Conservation Lands map. This map represents the parts of the “green infrastructure network” that are currently managed for conservation and as open space. The assessment includes existing and planned permanent conservation lands that are actively managed by a public entity. Jacobs, J.R., R. Srinivasan, and B. Barber. 2008. Southern Forest Land Assessment: A cooperative project of the Southern Group of State Foresters. College Station, TX: Texas Forest Service. 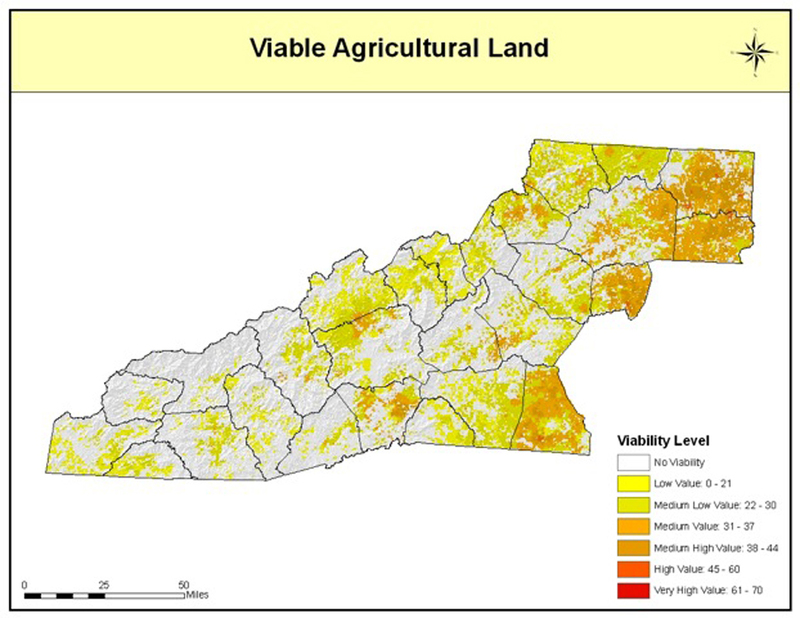 83 p.
One NC Naturally Conservation Planning Tool. 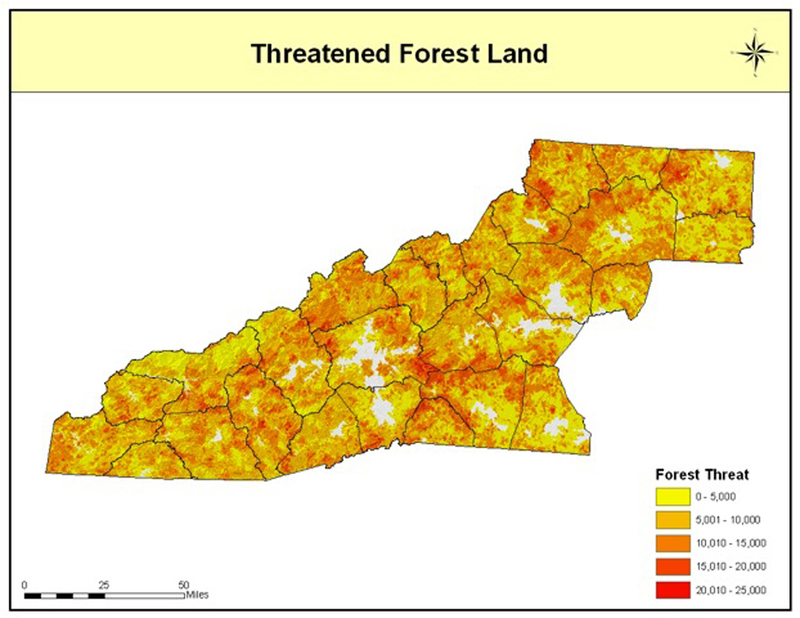 Accessed December 2011 from: http://www.conservationtool.nc.gov/.